The unique and wonderful jazz pianist Horace Parlan died in his sleep on February 23 in the Danish nursing home he had been living in for several years; he was 86 and had been in poor health for some time. Perhaps it’s just as well he went this way, as much that he loved had been taken from him in recent years: his devoted wife Norma, his eyesight, his ability to go out and play; seemingly he didn’t have much left to live for. He might have disagreed though: as we shall see, he was no stranger to adversity. 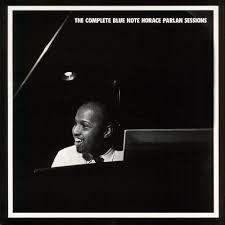 Whether a blessing or not, when someone as special as Horace Parlan passes, it’s a blow, one felt by many. Certainly veteran and hard-core jazz fans treasured him, but more recent or casual converts to the music may barely know of him; he’d been tucked away in Denmark since the mid-70s and hadn’t been very active of late. Parlan was born on January 19, 1931 in Pittsburgh, and was adopted as an infant. Pittsburgh produced not only steel, but important jazz pianists. The city’s rich piano legacy spanned several generations and styles, and included (in more or less chronological order) Earl Hines, Mary Lou Williams, Billy Strayhorn, Erroll Garner, Dodo Marmarosa, Sonny Clark, Ahmad Jamal, and Parlan. All of them are gone now but Jamal, who was born about six months before Parlan and still seems to be going fairly strong. Along with Django Reinhardt, Carl Perkins, Bill Kirchner and maybe a handful of others, Parlan found his way around a severe physical handicap to become a great jazz musician. The limitations Reinhardt and Kirchner faced came in adulthood as the result of injuries sustained in a caravan fire, and an operation to remove a spinal tumor, respectively. In Kirchner’s case the loss of mobility interrupted his playing career and he had to face an arduous road back, and thankfully did so. The problems faced by pianists Perkins and Parlan came much earlier as the result of childhood polio and they formed a mirror image: Perkins’ left arm was severely bent, whereas the two middle fingers of Parlan’s right hand were badly misshapen, permanently splayed upwards. Parlan’s polio struck in his first year and when he was five his parents thought playing the piano might provide some recreational therapy for him, probably never dreaming he would turn to playing the instrument as a profession. Luckily he had an open-minded teacher who perceived his gifts and threw away the piano “book”. Parlan’s handicap was especially daunting for someone aspiring to play bebop and other forms of modern jazz on the piano, which relied more heavily on the right hand than the left, particularly in playing all-important solo lines. The left hand was generally used for sparse chording rather than more orchestral playing, as in stride. So much so that older pianists – famously, as with Art Tatum and Bud Powell – often accused the boppers of “having no left hand”. This may have eventually provided a clue for Parlan as to a solution: he would have to develop two left hands, one to take care of its own business in the bottom end and the “other” to roam upwards to coordinate with and help out the right in playing lines. It can’t have been easy, but that was essentially what he did. If one is unaware of his limited right hand while listening to Parlan on records, there isn’t a sense that anything is missing. He is perhaps leaner and less florid than some other pianists and tends to avoid the extreme registers, sticking more to the middle of the piano. Sometimes he plays short jabbing phrases, but these are interspersed with some surprisingly long and angular runs, and he’s fully capable of playing block-chord passages in his own personal way. He managed to turn his limitations intro strengths, as his pithy, no-fat style is a refreshing antidote to the excesses some pianists indulged in. As a musician once put it, “the thing has 88 goddamn keys and some pianists just can’t avoid the temptation to sound like they’re trying to play all of them at once.” He made up for any technical deficiencies with the intense feeling he projected, his inherent swing and rapport for playing in a rhythm section, and his very big ears: he was one of the hardest-listening pianists of all. He also developed a crafty and distinctive harmonic vocabulary, often conveying complex harmonic ideas or colours with fewer notes and smaller chords than other pianists, combining conventional bebop harmony with his own brand of gospel-tinged modality. In short, he implied a great deal and seemed to be able to play whatever he heard or whatever he wanted to. And more importantly, whatever the music needed. Perhaps as a result of all his intense efforts to develop a style using his so-called handicap, and the release of personal expression that he eventually found in the piano, playing jazz was a religious experience for Parlan. It certainly felt and sounded that way. It helped that his adoptive father was a Baptist preacher, as Parlan grew up steeped in black church music – gospel, spirituals and hymns, but also the more secular blues that were so closely related. These elements were always present in his playing; in the way he voiced chords, in his deeply percussive attack and sparkling sound, a natural funkiness and above all in his percolating rhythms. 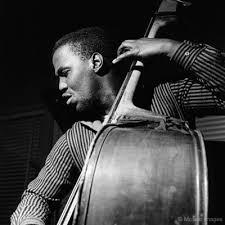 After leaving Mingus in 1960, Parlan formed a marvelously cohesive trio with two very compatible, but contrasting, musicians: Floridia-born bassist George Tucker, whose heavy-toned, throbbing sound and conception were not unlike Mingus; and the feather-light, crisply tasteful drummer Al Harewood, from Brooklyn. Parlan’s combination of earthiness and grace dovetailed with these two beautifully and the trio would become one of the preferred rhythm sections of the early 1960s, valued for their no-nonsense commitment to straight-ahead swinging. They played for a while as the house trio at Minton’s Playhouse, where they came to the attention of Blue Note owners Alfred Lion and Francis Wolff. Blue Note signed Parlan as a leader, and he would make seven albums for the label between 1960 and ’63: in order, MOVIN’ & GROOVIN’, US THREE, SPEAKIN’ MY PIECE, HEADIN’ SOUTH, ON THE SPUR OF THE MOMENT, UP & DOWN, and the aforementioned HAPPY FRAME OF MIND. 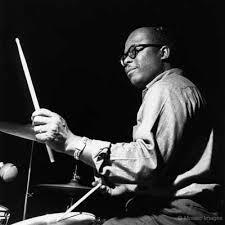 Sam Jones and Al Harewwod were the rhythm section on the first Blue Note trio record, but George Tucker and Harewood played on the rest of Parlan’s albums for the label except for the last one. The first two were trio albums, with Ray Barretto’s congas added on the fourth, HEADIN’ SOUTH. The others expanded to quintets or sextets, with such players as the Turrentine brothers, Grant Green, and Booker Ervin, who grew very close to Parlan during their time together with Mingus. Collectively, these records form an impressive and immensely enjoyable body of work: they’re swinging, inventive and uncluttered. And now they seem more interesting, more organic and sincere than much of the “soul-jazz” that was being ground out back then. For a long time they were very hard to find, often as rare and expensive Japanese imports. As it has so often done, Mosaic Records performed a jazz public service by issuing all of them in a five-disc box set years ago (right), which I have never regretted buying. For those not interested in detail or annotation, these records are now packaged in a cheap box set from Real Gone Jazz, called HORACE PARLAN: SEVEN CLASSIC ALBUMS, available from the usual online suspects. The covers of these Blue Notes are dotted throughout this piece, simply because they look so good. 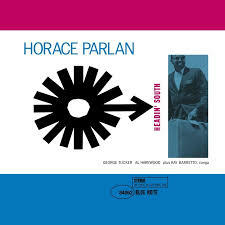 For those who want to find out more about Parlan as a person, I highly recommend the 2000 DVD HORACE PARLAN BY HORACE PARLAN. I can’t think of a more moving or pleasant way to spend an hour. Parlan performs some of his own compositions in his home, with bassist Willi Pedersen, talks about his early development and career, chats with his wife Norma about how they met and hangs out with the visiting widow of Charles Mingus, Celia Mingus-Zaentz. Throughout he shows himself to be the very gracious and good-humoured man he was. The DVD is available on YouTube; I haven’t provided the link here but readers will find it readily from any of the other clips I’ve included. I’m very grateful I had the chance to play with Horace Parlan once very briefly, at least thirty years ago. Horace was in Toronto playing a solo engagement at Café des Copains, and, as often was the case with pianists playing that club, he was a featured guest on the weekly Saturday afternoon live broadcasts run by Jim Galloway from the Trader’s Lounge of the Sheraton Hotel. It being so long ago, my memory of some details is a little hazy. I don’t remember if Horace did one or two sets with us, or what tunes we played, or whether he was featured on some trio numbers – he likely was. Galloway played with us and there may have been another horn player; Terry Clarke was the drummer. What I do remember is how easy Parlan was to get along with, both on and off the bandstand. He was a delightful guy, a gentleman. Thoughtful and soft-spoken, but also genial and friendly with a warm smile, he radiated positivity. And there wasn’t the slightest trace of “I’m black and you’re white” or “I’m American and you guys are Canadian” from him. He was happy to be there, to play with good musicians he’d only just met, regardless of where we were from. Then we started to play, and the good vibes went through the roof: within two beats it was one of the happiest rhythm sections I’ve ever played in. Believe me, I’ve played with more than a few of these, but this was different, somehow elevated. Horace gave off a trance-like energy of joy wed with total relaxation; he inspired Terry and me to play our best but also left so much space for us to come through. It was so secure and locked-in but also very open, so we felt as though we could play anything. And it swung like mad. I was standing next to the bottom end of the piano and watching with fascination as his left hand roamed over the piano in flashes, up and down and all around, producing all these infectious sounds: clusters and roaring chords, glittering tremolos and goosing push-beats. But after a while, I had to avert my eyes because watching him was so dizzying I felt like I was going to fall over. So I just watched his face: beaming, eyes closed, and suffused with sweat. And occasionally I turned to Clarke, who had a “can you believe this groove?” smile on his face from ear to ear the whole time. 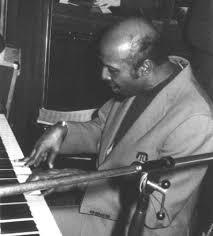 God, Horace Parlan was wonderful to play with, so powerful and yet so easy. It’s one of my fondest jazz memories. I wish it had lasted longer and I’d give anything for a photo of Horace, Terry and me, but I’m lucky it happened at all. Though the details have faded, I’ve taken a lot from this singular experience all these years: that playing jazz is a deeper communion than I’d realized, and that sometimes your jazz heroes are even better than you thought. And above all, despite all the tribulations, being a jazz musician is a privilege that should make one happy and grateful. Jazz abhors cuteness, but has always valued unique and original voices. Along these lines, the quotation of Thelonious Monk which opens this piece applies to Horace Parlan as well as anyone else in jazz. He came along and did what many would consider impossible in overcoming his physical limitations. And, while he perhaps wasn’t quite a genius, there was brilliance in the courage and imagination he showed in finding himself and his own way of playing, and in the musical results, which are all that count in the end. He is a striking reminder about one of the greatest qualities of jazz: its inclusiveness. All are welcome, provided they swing, have something interesting to say and play like they mean it. 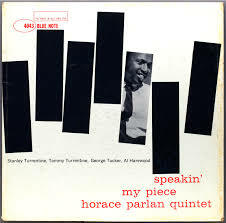 Horace Parlan did all that and more every time he sat down at the piano. © 2017, Steve Wallace. All rights reserved. Great as always, Thanks Steve! Wonderful evocation, Steve, I could hear those records without clicking on them. A great tribute to Mr. Parlan. Thank you! I will go and check out more of his work. Beautiful piece, Steve. You made me realize that, aside from his great playing, an important part of his talent and influence was the way he made the other musicians feel and play. One of my favourite later Parlan records is “Glad I Found You” from 1984, with Thad Jones, Eddie Harris, Jesper Lundgaard and Aage Tanggaard. I’m going to go dig that out now. So, I found the CD but it doesn’t play the way it used to – weird gurgling noises throughout. Oh well. But I do have some monthly credits to play with at Emusic. They had the album, so that was $2.94. Now the problem is that, judging from past experience, anything with Horace Parlan on it is going to be good and there were 91 albums listed, of which I have maybe a dozen. But that’s what they call a good problem so I’m starting with Doug Raney’s Cuttin’ Loose (with Parlan, NHOP, Billy Hart and Bernt Rosengren). The rest, as they say in the jazz business, will have to wait. Really enjoyed this Steve, great work! Thanks so much. Thanks to Reg Schwager for alerting us to an obscure gem of an album that I, for one, was previously unaware of: Horace Parlan’s GLAD I FOUND YOU. The entire album is on YouTube. It features three of my heroes: Horace Parlan (whom I never knew, but as Steve notes, with whom I shared a special kinship), Thad Jones (whom I did know), and Eddie Harris. Plus one each of Europe’s finest bassists and drummers. 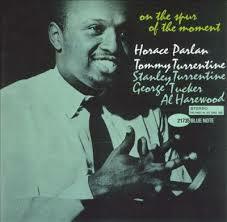 If ever a jazz musician exemplified his music, it was Horace Parlan. R.I.P. Steve your writing and knowledge of Jazz continually amazes me. I remember Harlan’s name but your article and the video clips have given me a deeper knowledge of his musical abilities and the way he overcame his physical challenges. My education continues……..thanks! Thank you Steve! Great article about a wonderful player. Thanks so much for this Steve. Wonderfully written. I’m looking forward to checking out some of these albums that you mentioned that I don’t know. Sounds like such a great man. I just wanted to say how much I enjoy these blogs. You have a wonderful writing style that is both informed and conversational at the same time. I am learning so much more about this music that I love. Thank you! Wonderful articles on someone who was so under-rated. When I had my radio show in the 80’s, I would occasionally begin with ” Wednesday Night prayer Meeting” and his solo just before Booker Ervin’s solo sets the tone. Happy he had a long and productive life.